A monthly Welsh language periodical serving the Baptist denomination and its Sunday schools. The periodical's main contents were articles on religion and literature, however, it also had sub-editors that covered subjects such as biography and antiquities, news from meetings and politics. Amongst its editors were Llewelyn Jenkins (1810-1878),the Baptist minister, Nathaniel Thomas (1818-1888), Samuel Evans (Gomerydd, 1793-1856), William Owen and Aneurin Jones (Aneurin Fardd, 1822-1904). 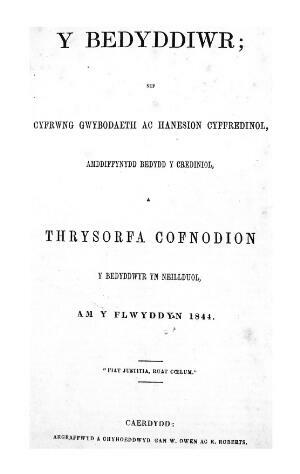 Associated titles: Y Gwir Fedyddiwr (1842).